I really don't understand why there's so much Fox News satire out there, they do a good enough job of humiliating themselves without any outside help. Is it screenshot or screencap? 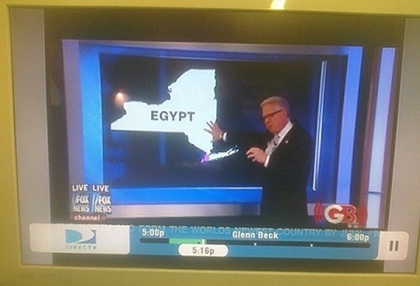 That screencap above was from Glenn Beck who claimed Egypt was in New York State. Well okay he didn't say that, he actually said "New York is about the size of Egypt". No joke. Now, I love maps. As a kid my parents used to buy me atlases and globes and wall maps for birthdays and other celebrations that involved the capitalistic exchange of gifts. I was obsessed with them. I still am. I often wonder to myself had I not got into computer science or if I were born before the age of electronics that perhaps I would have tried my hand at cartography. What a deeply fascinating field! I'd probably have to go outside to do that though. Hmm, spanner in the works. That said, it doesn't take someone with relatively intimate global geographic knowledge to know New York State is nowhere close to being the size of Egypt, not in population and certainly not in land area. My sister is knowledgeable in other fields and never really caught the geography-interest bug, but even she laughed out loud when I told her about this. That's right, New York State is only a fraction larger than 12% the size of Egypt. That's not even close! Am I splitting hairs about this? Perhaps, but Mr Beck is an anchor of a television programme on an alleged news network watched by millions, most of whom I imagine never question anything he says. 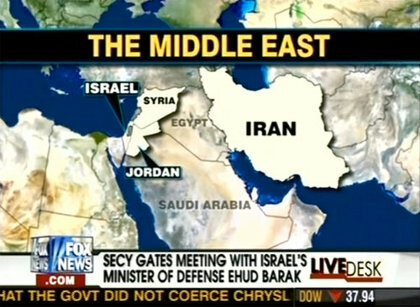 If Glenn tells me that Egypt and New York are "about the same size", then it must be true! Even if he were reading from a script (I don't know, I don't watch his show), the common sense part of his brain should have alerted him to this obvious absurdity of what he had to say, and he would have corrected it on the spot. Which leads us to two inevitable conclusions: either he made a slip of the tongue and didn't notice (unlikely given he had a graphic created to demonstrate his point), or he's as breathtakingly ignorant and knows as much about Egypt as his host network. I end this post the way I started it. I really don't understand why there's so much Fox News satire out there, they do a good enough job of humiliating themselves without any outside help. Thanks to Firedoglake and Media Matters for America for the screenshots, or screencaps, or whatever they are.